? Front panel is made of aluminium alloy(thickness:10mm) with wire brushing.
? Back panel is made of aluminium alloy(thickness:6mm) with wire brushing.
? Transformer case with high grade paint, transformer shell made of aluminium in wire brushing.
? Top grade drum-shaped metal knob, honeycomb-shaped feet.
? 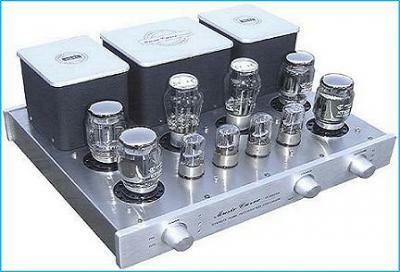 Top grade signal RCA terminal with golden plating.
? Signal Switch:OMRON sealed silver Contact Relay switching, have a long life, no switching noise.
? Total power adopts relay with high current to connect.
? 4?and 8? output terminal with golden plating (now replaced by braking are high-grade gold amber Connection).
? Blue power indicator.LED red button for switching on with preheat instructions.
? 6N8P(6H8C)*4 pcs for pre amplification.